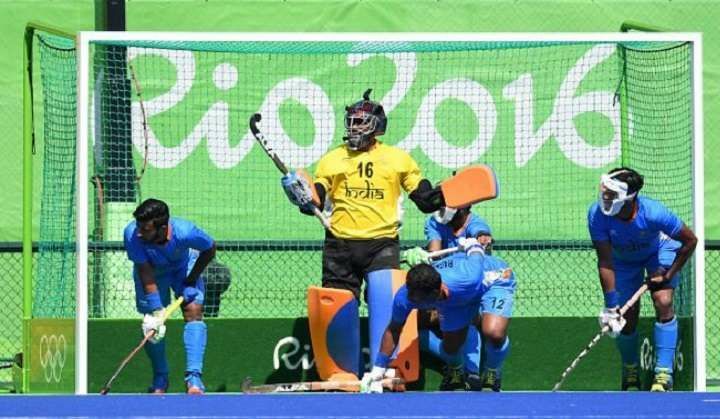 A goal was conceded barely three second from time from the Indian men's hockey team as they lost 2-1 against reigning double Olympic champions Germany in their second Pool B match of the Rio Olympics on Monday, 8 August. After weathering India's attacks for the majority of the game, the Germans exerted tremendous pressure on the Indian defence in the final two minutes and stole the win with just 3.1 seconds from full time. Christopher Ruhr scored the winner for Germany with a deflection from close range to dash the PR Sreejesh-led side's hopes. Earlier, Germany took the lead against the run of play through a field goal from Niklas Wellen (18th minute) before Rupinder Pal Singh (23rd) drew parity for India by converting his third penalty corner of the Games. The win helped Germany keep their successful run intact against India since 1996. India last defeated Germany in Olympics way back in the Atlanta Games when they secured a 3-0 victory. Despite the loss, the Indians can take heart from the fact that they dished out a much better display against Germany today than what they managed in the recent past, which includes a 3-3 draw against a depleted German side in the Champions Trophy in London and 0-4 thrashing in Valencia just prior to the Olympics. India started the match as underdogs going by the recent record against the Germans, who were in search of their third successive Olympic gold, but it turned out to a very closely contested battle. It was 0-0 between the two sides after the first two quarters, with both teams showcasing some good attacking and defending skills. The Indians had the better share of exchanges in the first quarter and put the opposition under tremendous pressure midway through the first quarter, but the German defence did just enough to avert any crisis. It was India who had the first scoring chance in the 11th minute but Nikkin Thimmaiah's backhand shot from an Akashdeep Singh feed was padded away by an alert Nicolas Jacobi in front of German goal. In their opening encounter, India had defeated Ireland 3-2. They next face Argentina on Tuesday.